Modern genre of history which is two centuries old by now insists on two prerequisites, time-space coordinates, to situate any event or person in a historical context. The heuristics of any available evidence conforming to these coordinates will distinguish a historical fact. These determinants of authenticity of a historical record are borrowed from the principles governing the commercial and property transactions of the medieval and early modern Europe. The ‘instruments’ of commercial nature will directly and materially affect the concerned individuals and/or their succeeding one or two generations. Therefore, the genuineness of the document in question is subjected to scrutiny and if necessary corroborative evidence is also required in resolving the legal disputes arising out of such transactions. The application of these principles to the impersonal matters like historical inquiries without any discretion complicates the issues rather than solving them. One can not deny the existence of his forefathers preceding four or five generations because he does not know their names, the dates of their births and deaths or the locations where they lived. For the history of the recent past, these two coordinates may appear to be more relevant as the recent happenings have direct bearing on the present and near future. We get different types of source material for writing about a recent happening. A historian can make use of corroborative sources to attempt a historical narration. European history being relatively recent, the time-space determinants may hold validity to an extent. When we are attempting to write the history of the civilizations and the peoples of remotest past whose antiquity can not be traced, a historian should use his discretion applying commonsense, reason and logic, as the basic tenets of scientific method of inquiry while examining the available historical source material to bring out the essence of the remote history for the benefit of mankind. Bharat Varsha, the Indian sub-continent or South Asia, is endowed with voluminous record – oral, literary and archaeological – of the history of not only its people and their culture but the history of entire Creation and its secrets. The rich oral tradition which has come down to us through infinite number of generations defy our estimation of its origin in every respect because it speaks of mind boggling reckoning of Time and infinite creations. Veda is believed to be eternal. It is a revealed knowledge. The revelations of great sages are handed down to us as oral tradition. The classification of this knowledge, Veda, was attempted by Sage Veda Vyaasa whose times are connected with the great event, the Battle of Kurukshetra. Sage Vyaasa had much higher objectives for this classification than making it a chronological account. Most of the mantras included in the ‘Samhitas’ of the four books of Veda being common, the Sage has benefited the humanity with the Knowledge being presented in four different ways for varied purposes. The sage had given each version of the Veda to one of his able disciples for preservation and propogation. 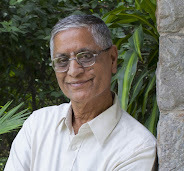 Modern historian assigns different periods for the origin of Rigveda and other Vedas citing certain changes in society to legitimize the Linear theory. When the author of these four versions of Veda was one and the same, it is a matter of simple commonsense that these books (oral) are contemporaneous. Sage Vyaasa also gave us the PuraaNa which speaks of the history of many creations and major events therein, both Cosmic and mundane. The genealogies of Rishis and major dynasties of rulers are given in the PuraaNa which Sage Vyaasa has recorded as handed down to him by his father, Sage Paraashar. Sage Paraashar got this knowledge of remote history as a revelation. Out of this one body of PuraaNa (Vishnu PuraaNa? ), eighteen Maha PuraaNaas were composed during Mahabharata times. The major content and characteristics of these PuraaNaas being the same, each PuraaNa is endowed with some peculiarities of its own in its presentation and emphasis given to a major concept or phenomenon. Subsequently, many subsidiary puraaNaas, Saastras, Darshanas, Sutra and Kaavya literature were composed in different periods of time and published through oral transmission. The PuraaNic literature has been updated periodically. Though the origin of PuraaNic literature could be dated to Mahabharata and immediately after Mahabharata times, we can not fix up the exact time when the literature was made available in written form for the first time. Since the material used for writing is of perishable nature, even the earliest manuscript found by us turns out to be the latest written version of the original work. The modern scientific dating methods might at best help us estimating the approximate date of an artifact or manuscript (conditions apply!). A historian with unprejudiced sense of reasoning would only say that the dating of the available copy can hardly determine the date of the original work. Bharat has no parallel in the world in respect of the quality, quantity, antiquity and continuity of its knowledge store. Vedic and PuraaNic literature give us very valuable data for tracing the history from the remotest past to the recent times. It may not be possible to assign a fixed date for every event or episode of the remote past which of course serves no purpose. But on that score the episode can not be dismissed as fictitious. The episodes in the Vedic and PuraaNic literature should not be blindly taken in its literal sense. They are encoded narratives. The solution for a riddle posed in one episode cited in one PuraaNa could be found elsewhere in the same work or in some other PuraaNa. It needs a mega view of the whole literature to understand and interpret an episode. So micro-studies should be attempted with only macro-understanding. Every ancient work, though specializes in any Sastra (science), or Dharma (conduct), or Art (music, dance or fine arts), or Itihasa (history) is encyclopedic in its nature and gives the benefit of a bird’s eye view of the universal knowledge and the Sanatana Dharma. Thus, every ancient work, irrespective of its special focus on an area, is capable of giving universal consciousness to a sincere seeker. In ancient Indian knowledge system, a specialty did not mean ignorance of the rest as we understand the specializations today. Holistic view was the order of the day. Therefore the problem should not be studied in isolation. Further, every ancient work was aiming at raising the conscious level of its clientele from the mundane to the Ultimate through the known to the Beyond. The Dharma as a Sutra (thread) runs through all the ancient literary forms. The essence of Vedic thought is given in PuraaNas and Itihaasas for mass consumption as educative entertainment. Sanatana Dharma, the basis of the Vedic thought and PuraaNic knowledge, is explained through the Epics as live narratives. In view of the mega time scale, the ancients have divided the eternal Time in Yugas, Mahayugas, Manvantaras and Kalpas. With the help of PuraaNic genealogies and the astronomical data available from the Mahabharata, many scholars have attempted to fix the date of Mahabharata War with negligible variations. These studies would confirm that the Great Event took place around 3000 BC. Now, it is not difficult to arrive at a reasonable time-frame for the Mahabharata which draws a line between the remote and recent past. Modern historian, free from prejudices, can fairly reconstruct Indian Chronology taking the date of the Great War as the sheet anchor. Since the chronology is the spine of the body of history, the gaps or missing links may be covered with logical interpretation of the valuable data from the ancient literature. Heuristics and hermeneutics employed in the modern Historical Method for studying ancient societies of remote past, when associated with common sense, reasoning and logic would help resolve many misunderstandings and misconceptions entrenched in the present historical writings. What is basically required of a modern historian is a positive approach to knowing truth. [*] He owes his understanding of the subject to Sathguru Sivananda Murty ji, Bheemunipatnam, A.P. India.